Today I am sitting down with my coffee to think about my 2018 reading goals (aka giant list of LIES for the year). This week I am drinking ALL OF THE COFFEES from Clifton Coffee Roasters. I am so pleased to be back home in the UK drinking the good coffee (so pleased that I bought 4 bags of coffee am merrily drinking my way to immortality). New Zealand was wonderful but its coffee was…not. Where in the World? Challenging us to read 6 books, each one from a different continent. I’m not entirely sure if this is meant to be written by someone who originates from the continent or a novel set in that continent, but I’m going with the first and hoping that it encourages me to read more widely. I’ve managed to tick one off this so far and I do have a few ideas for a couple of others, but am open to suggestions! Magic Square. This is one of my favourite of Paul’s challenge designs. 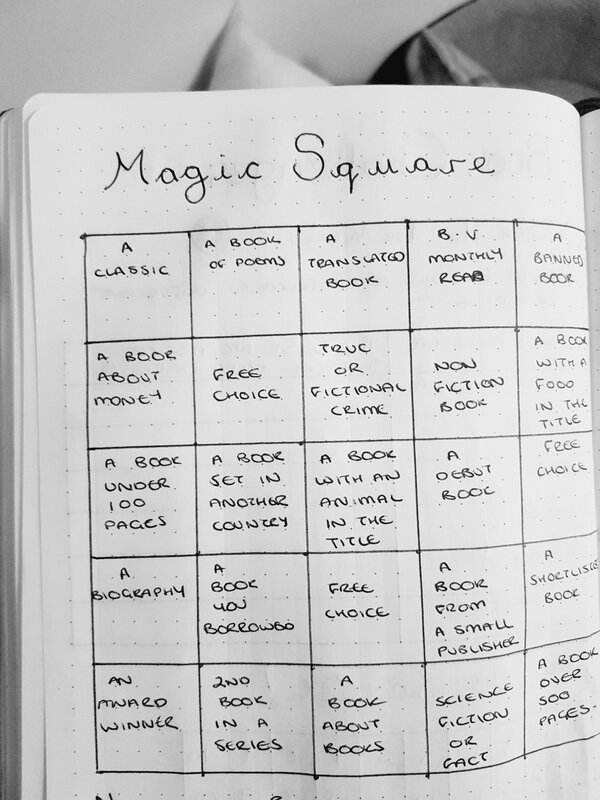 It involves a big square made of smaller squares, each with a different reading challenge (eg “A Classic” or “A book with an animal in the title”) there are 25 of these (though the challenge can be done on smaller squares within the square if 25 is too much for you) and I plan to read from each. I’m feeling positive about this one. 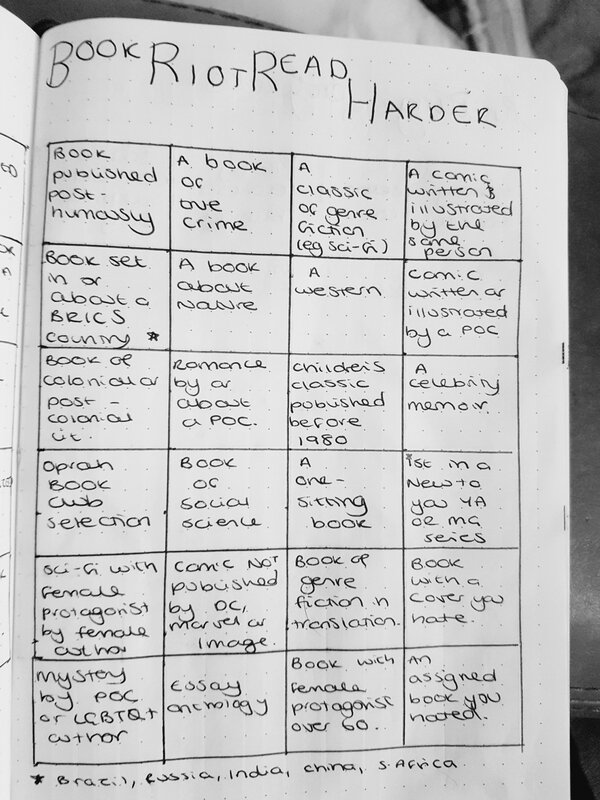 I am also planning to take part in the Book Riot Read Harder Challenge which is a similar set-up, this time with 24 squares each containing a different challenge. This one is going to be much, much harder because it contains genres / ideas that I wouldn’t normally consider (most notably “A Western”). I’ve given each of these challenges a page in my bullet journal, so I can track my progress through the year. If you see a square on here and have an idea for me to read for it then please, please shout up! Bonus points if you can find me a book that’s on Mount Ted TBR! I’ve joined this one with my Goodreads shelf and ‘ve been sorted into Story Sorcerers, which sounds like my dream job. I’ve set a goal of 40 books off my backlist by the end of the year. That’s 40 books published BEFORE 1st January 2018. Mount Ted may never change in size but at least I’ll be shifting some of his old rocks (ok, that just sounded wrong, but I’m going with it all the same). I’ve started shelf of possibles, but if you have a suggestion for me, then let me know in the comments. The final challenge I’m signing up to for now is the Netgalley Bronze Challenge hosted by Bookish Things and More . I am up for the challenge but it’s near certain that I’m going to constantly forget to log the updates in the official way. I’ve gone for Bronze as the next level up involves reading 25 books and (smug face) I don’t have 25 outstanding Netgalley reads. I’ve ticked one off already and everything I have is a book I really want to read so I have NO EXCUSES. I do want to work on buying less books because I have a problem. A real problem. I am not going to do a ban though, because I tried that once and it resulted in this rant (and I haven’t read a single book from the haul that broke that ban). What challenges / goals have you set yourself for your reading this year? Do you have any suggestions for books that fit mine? Let me know in the comments! Thank you. Enjoy your challenge too! For a book swap thing?